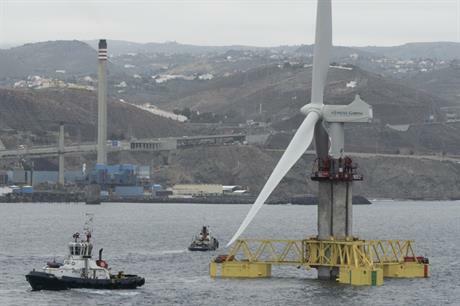 SPAIN: A turbine with a prototype 'telescopic' tower has been installed off the coast of Gran Canaria. Spanish infrastructure firm Esteyco’s Elican project consists of a 5MW Siemens Gamesa turbine with a tower in three concentric sections designed to slide into one another – like a telescope – mounted on a gravity-based foundation. Both tower and foundation are made of concrete. The turbine can be fully assembled onshore and then towed to site by tugs. This removes the need for jack-up vessels traditionally used in offshore installation, Esteyco stated, and so reduces installation costs by about 30%. The tower’s telescopic design also lowers the turbine’s centre of gravity during transport. At the project site, Dutch company Ale Heavy Lift erected the tower’s three sections remotely via WiFi from a nearby vessel to increase safety. The Spanish infrastructure company aims to fully commission the project in the fourth quarter of 2018. Esteyco first unveiled the tower in 2016 and has received funding from the European Commission under its Horizon 2020 programme for smart energy systems. The 'telescopic' tower concept can also be used for turbines installed on monopiles or floating foundations.